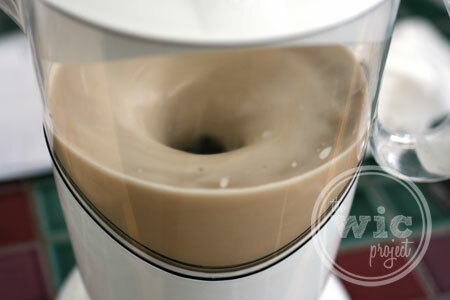 A few years ago, I did a comparison between Starbucks Vanilla Chai Tea Lattes and Dunkin Donuts Vanilla Chai Lattes. Years later, Vanilla Chai is still one of my favorite hot drinks to enjoy. 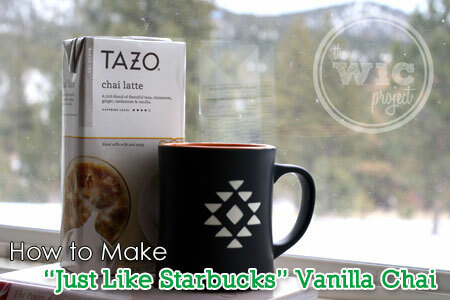 For just as many years, I’ve been trying to make Starbucks Vanilla Chai Tea Lattes at home. I’ve tried various recipes using different chai teas, vanilla chai mixes, and chai concentrates, but none of them seemed to come out just right. They didn’t have the same kick or the same strength. They were just missing something. So finally, I decided, “Why reinvent the wheel?” As long as I can remember, Starbucks has been happy to sell me the various syrups and ingredients they use to make their clever caffeinated concoctions. I learned that when I discovered how to make Starbucks Salted Caramel Hot Chocolate. 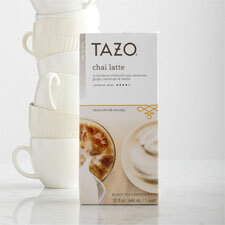 Today, I stopped by the local ‘Bucks and picked up a box of their TAZO Chai Tea Latte concentrate. They also sell TAZO Chai Tea Latte Concentrate on Amazon. I already had a bottle of Vanilla Torani Syrup in my cupboards. If you don’t have vanilla syrup, you can pick-up that and sugar-free vanilla syrup online for $9.95 as well. Many grocery stores also care flavored syrups in their coffee aisles. With milk already in the fridge, I had all the ingredients I needed to make a Starbucks Vanilla Chai Tea Latte. I got home and promptly threw the ingredients into my Cocomotion (seriously, if you don’t have one of these, get one now. You will thank me.) If you don’t have a Cocomotion, you can either microwave in a microwave-safe mug or heat it on the stove. Just put everything into the Cocomotion – it heats and mixes it for you! Just a few minutes later, I had a vanilla chai tea latte that tastes exactly like what I pay $3.50 for in the coffee shop. Except this time, it costs way less. The chai tea concentrate costs just $4.95 and will make about 4 grande-sized vanilla chais. The cost of the milk and vanilla syrup work out to just a few cents when you divide it out; let’s say, about $0.25. When it’s all added up, I save over $2 per chai by buying the ingredients and making it at home. If I treat myself to two grande vanilla chais a week, that works out to saving $16/month and $192/year, not to mention saving money on the gas I’d need to drive to Starbucks. Not having to wait in line is a bonus as well. Another nice perk is that you can customize your chai latte to be stronger or weaker just by adding more or less chai tea latte concentrate. I’m thinking about playing around with some other syrup flavors as well, like a Salted Caramel Chai Tea or Hazeulnut Chai Tea – don’t those sound good? Note: You can follow this same recipe, but leave out the vanilla syrup to make a regular Starbucks Chai Tea Latte. Mix milk, chai concentrate and vanilla syrup over medium high heat on the stove until hot or just throw everything into a Cocomotion and hit "On". When hot, pour into mug and enjoy! Some Starbucks stores add water to their chai tea lattes. Rumor is that the “official” Starbucks Chai Tea Latte Recipe calls for adding hot water after the chai to help the chai spice flavor come out. I’ve tried it with water and it may be a bit spicier, but I prefer it with milk. Pour chai concentrate and hot water into mug. Stir. Optional: Add 2 Tbsp (2 pumps) of Vanilla Syrup. Ive been on a real Chi kick lately, thanks! I’m not a starbucks fan but I’m all about at home and saving costs. Thanks! My daughter loves this. Thank you so much for sharing. I will be making it for her tonight. I love chai but green tea chai is my fave. I do not like Starbucks but my daughter LOVES chai tea and this sounds like something she would really enjoy. She will be back from college soon so I guess I’ll have to make this for her. I don’t really like chai flavoring but I want a cocomotion. I have never seen one of those. So cool! This is my husbands favorite drink from Starbucks. Will have to give this a try, thank you. I’m addicted to Green Tea Lattes from ‘Bucks, but and with soy. I FINALLY figured out that there is no secret to making them: hot organic soy milk, matcha powder and some stevia. SOOOOO much cheaper than the store version, just as tasty, and I can put the savings in my piggy bank! very cool. I am always looking for ways to make stuff at home, to save money, so thanks for the post! I love vanilla chai tea latte! I had no idea you could make it at home. thanks for sharing. I’ve never tried any of the Chai Tea Lattes at StarBucks! This looks really good! Thanks for the recipe! I always like finding shortcut recipes to make for less at home. This recipe turned out to be one awesome drink!!!! Thanks so much. I cant afford Starbucks anyway, so this is a great help!! Lately, my chai lattes from Starbucks have had too much water, not enough milk and don’t taste spicy at all. It’s a bummer when you take the drink back three times before you get one that tastes like something more than hot water. Pretty cool…The salted caramel hot cocoa sounds wonderful, too! Oh thanks for the recipe for this.My daughter – in -laws with love you to pieces for it. It will be way cheaper to make at home then buying at Starbucks. Thanks for the recipe, I love chai anything! goodie gumdrops I’m a do-it-yourselfer, and that includes making my own brand name recipes! I can’t wait to make this myself! I have never tried a latte before.I will try this recipe to see if I like it or not.Thanks for the recipe! I have never heard of the Cocomotion before, so thanks for the information and the recipe, I will have to try both! I don’t drink coffee but everyone around me does. I like to be able to offer them nice coffee drinks that I can make myself. These certainly fit the bill! Thank you. Great recipe. Thanks a ton for sharing. Can I make this using store bought almond milk like Blue diamond unsweetened almond milk ? I haven’t tried it, but I don’t see why you couldn’t use almond milk as a substitute. You might be able to omit the vanilla syrup if you went with a vanilla flavored one as well, potentially. Let me know if you try it! I was told by a barista at Starbucks to order my Chai Tea Latte as a “no-water” Chai Tea Latte.